To ensure your ATM banking sessions are secure, here are some simple security tips you should follow. Beware of any foreign object/device attached to the ATM machine that makes it look unusual. 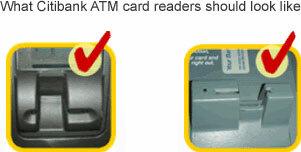 Dip your card into the card reader and remove it. Do not leave the card in the slot. Do not let anyone see your PIN when you are keying it in. Ensure no one is looking over your shoulder. Never disclose your PIN or lend your ATM card to anyone. If you notice any foreign object on our ATM or have trouble inserting or withdrawing your card, Please call CitiPhone at (84 28) 3521 1111 (84 28) 3521 1111. Find out more about Online Security.